This year I participated in two NFBC-style leagues. I wish I could write that I excelled in both and left the competition in my wake. Instead, I will state that I failed miserably in both. Drafting Giancarlo in both leagues amid many other missteps spelled disaster. Of course, none of that is a good excuse given the talent that remained in the undrafted pool. Which, for those unfamiliar with the NFBC draft and hold format, means that those players wasted away in free agency all year. 15 teams, 750 players drafted, and no transactions all year. Despite 750 players being selected, collectively we all failed to identify these gems. Instead, just from my own two rosters alone, I thought the following were more important to roster: Erik Johnson, Jimmy Cordero, Clayton Blackburn, Keone Kela, Roenis Elias, and Shane Greene. And these are just the most offending pitchers I drafted. Plenty others that would have been better exchanged for the guys mentioned here. Just as with the 2015 recap, saves are rather unpredictable compared to hitting stats. In each league, roughly 15% of all saves were left undrafted. In both leagues, Jeanmar Gomez (37 saves),Edwin Diaz (18 saves), Brandon Kintzler (17 saves), Tyler Thornburg (13 saves), and Carlos Estevez (11 saves) were left on the proverbial bench. A number of relief pitchers without double digit saves remain as well. For my part, I thought Edwin Diaz was one season away. Carlos Estevez was on my radar but I didn’t expect him to both reach the majors and take the closer role. Tyler Thornburg didn’t make sense to me as a closer and probably still doesn’t to anyone who watched him blow three saves this past week. 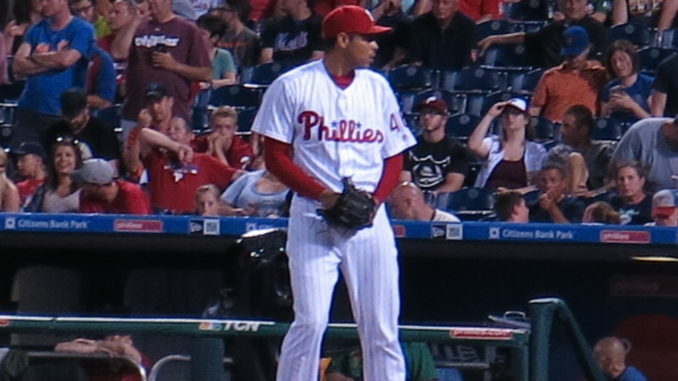 And Jeanmar Gomez–he of the 37 saves–was but one of many possibilities that could have ended up closing in Philadelphia. I bet on the wrong horse in David Hernandez who was serviceable but ultimately useless in a traditional 5×5 roto league. I stand by the statement that saves are unpredictable, but I do wonder if 15% indicates that saves are worth chasing late and focusing more on other needs earlier in the draft. Also like in 2015, middle relievers and spot starters account for many of the undrafted wins. Tyler Chatwood, Steven Wright and Ivan Nova each went undrafted in a single league. Wright was completely off my radar but I have already lamented my Nova oversight in the pre-season recap. And no excuse for Chatwood not being drafted. As for pitchers undrafted in each league, only two stand out: Dan Straily and Junior Guerra. Despite Straily’s 2016 contributions, it is fair to not find fault with his omission. His peripherals and underlying stats from 2014-2015 suggested a below average starting pitcher. 2016’s underlying stats suggest the same thing: high HR/9 rate, high FIP, and high xFIP. Junior Guerra, on the other hand, is someone that I should have drafted. In my 28-team dynasty league, I purposely signed him to a multi-year contract last year because his 2015 minor league numbers with the Chicago White Sox’s AA and AAA teams suggested the possibility of something more. Granted, in a 28-team league one looks for any potential upside and snags it up with the knowledge that most do not pan out. However, the final 5-8 rounds in a 50 round draft are somewhat similar to a deep league. Many average to below average players. What we should be looking for are possible diamonds in the rough. Just like Guerra.